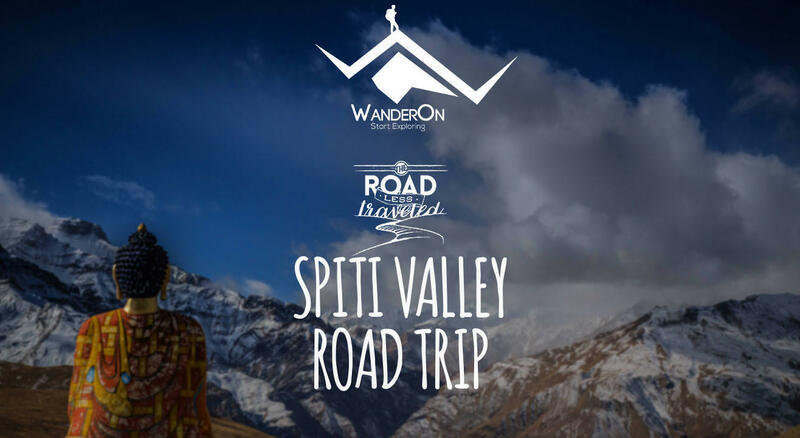 WanderOn presents most awaited Spiti valley Road Trip. If this doesn’t excite you, nothing can. Separated from fertile Lahaul by the soaring 4551m Kunzum La, the trans-Himalayan region of Spiti is another chunk of Tibet marooned in India. The scattered villages in this serrated moonscape arrive like mirages, clusters of whitewashed mud-brick homes huddled amid green barley fields below monasteries perched on crags a thousand feet above. The turquoise-grey ribbon of the Spiti River is your near-constant companion, running along a fairly broad valley before turning south at Sumdo into the precipitous gorges of the Hangrang Valley. Spiti attracts many travelers, including streams of Indian motorcyclists, as a kind of ‘mini-Ladakh without tourist crowds’, which is fair enough, since its pristine nature (high-altitude desert) and culture (Tibetan Buddhist) are still intact. The approaches to Spiti remain among the most rugged and scenically spectacular roads in India. Reach Manali by morning and check-in to the Hotel. After having breakfast and some leisure, feel free to explore the local area of Manali according to the place that interests you. You can visit the Mall road, Hidimba Temple, Old Manali for some good cafe’s to chill or Vashisht temple for the Hot water Spring. Come back to the hotel by evening. Briefing about the next day and sleep overnight. Post an early breakfast, we start our journey to the valley of the Gods – Lahaul & Spiti! Crossover to Lahaul by passing through the adventure haven – The Rohtang Pass, and watch the terrain shift from lush green valleys to brown arid desserts. At 14,931 ft we cross another high altitude pass & the gateway to the Spiti Valley – Kunzum La. Continue our drive through the stunning landscape to reach Kaza by evening, and overnight stay in the camps/hotel. Being remotely located atop a hill overlooking endless plains, the Key Monastery is a world famous center for learning and is an obvious choice for those seeking peace and calm. Declared a national park in 1987, Pin Valley has altitudes ranging from 11,000 to 20,000 feet and is home to at least 12 endangered snow leopards. In addition, other animals indigenous to the region and park are the Siberian Ibex, Bharal, Weasel, Red Fox and Marten. Birds such as the Pika, Griffon, Golden Eagle, Bearded Vulture, Chukor, and Raven can be spotted flocking to the skies of the picturesque valley. We first visit the Kungri Monastery and then the beautiful hamlet of Mud – the last motorable village of the Pin Valley. Visit some of the highest inhabited regions of the world. The highest village in Asia – Komic, situated at a height of 4513 m, has a population of 84 people and is cut off from rest of the world for most parts of the year. Later, we drive to Hikkim, where we have a chance to send postcards from the world’s highest post office! At Langza, walk back to the prehistoric era when Spiti was submerged by the Tethys Sea, as you explore a land very rich with fossils of Marine animals and plants which were here millions of years ago. We start tracing our steps back towards Manali. However, make one last stop to witness another Spitian wonder – Chandra Taal Lake. The mystical and beautiful Chandra Taal Lake or the Moon Lake is located at a height of 14,000 feet. Later check in to the Campsite near Chandra Taal Lake, and overnight stay at the tents under the gaze of a million stars and the Milky Way Galaxy. Today, we commence our way back on the Manali – Kaza Road. We pass through some more stunning landscapes and cross the Rohtang Pass to reach Manali by afternoon. After some leisure at the Café, we board the Volvo to Delhi and reach by next morning with lots of amazing memories to remember for a lifetime! Any other food or beverage charges that are not included in the package. Any other costing involved due to any kind of natural calamity, forced circumstances, which are out of our control. Any other expense not mentioned in the inclusion column. Comfortable warm clothing like woolen socks, cap, fleece jackets or warmers, down jacket, toiletries.